Having worked for a number of years as a Dental Emergency specialist Dr Mumford can cope with just about any of the dental calamities that children can come up with, but these days we prefer to work in a more ordered and relaxed way to maintain healthy smiles in healthy kids. We try and keep all visits, especially the first one, as calm and relaxed as possible. On that first visit we like to minimise the amount of active treatment wherever possible so that the child can get to know us in a non threatening way. Then as they grow, we encourage a program of preventive Dentistry involving regular cleaning and fluoride treatments as well as fissure sealing of vulnerable teeth where indicated. 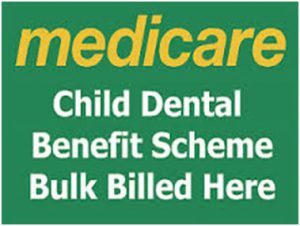 We know that budgets are tight so we include fluoride treatments in the regular clean and check up fee for kids and we bulk billl for those families eligible for the Medicare Child Dental Scheme.